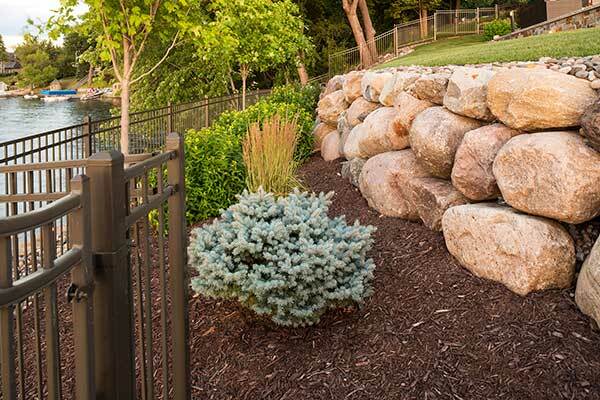 This peninsula residential landscaping project was three years in planning and two years to complete. The first meeting took place on the property with Southview Designs Landscape Designer Matt Burton, the real estate agent and the homeowner. The existing 1950s home was still there, with several steps leading down to the front entry. 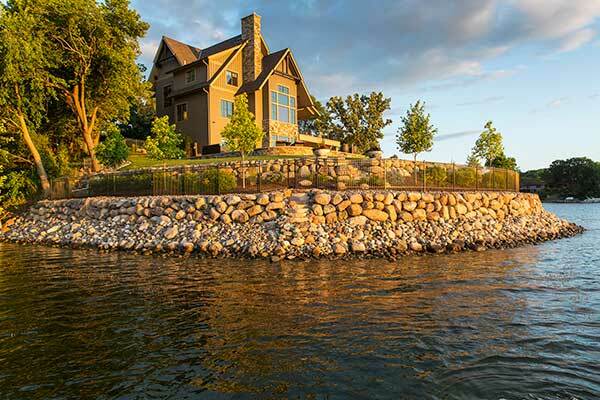 Before any new home construction could begin, a plan to control any erosion and drainage had to be addressed and all of the boulder walls at the lake had to be installed. 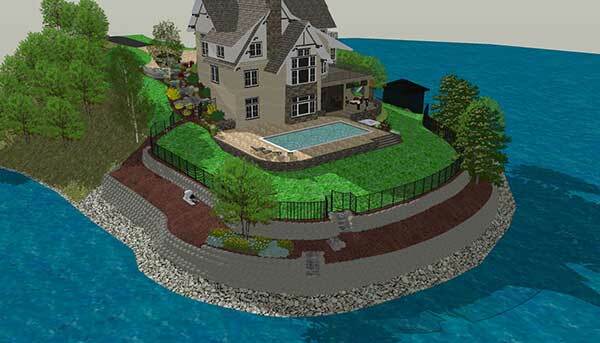 The proposed elevation of the house (raising the main level) plus the water on three sides, proved to be a challenge in developing a landscape drainage plan that met with approval of city and state inspectors. Calculations were made to determine how much water had to be contained in the well and on the property. The collection well off the driveway is 7 ft. deep and 8 to 9 ft. wide, filled with sand and rock. Its 6-in. perforated drain tile connects to a bio-swale, which effectively contains most of the storm water, allowing it to percolate down through the soil. Water coming off the south side of the house is directed toward the plants, trees, and sod. 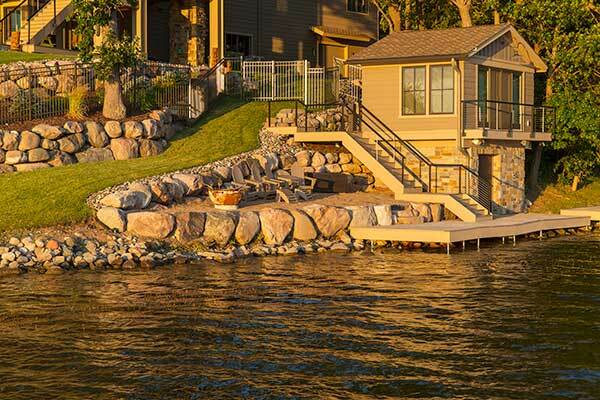 Boulder walls around the entire point raised the grade of the yard to prevent water from getting to the lake. The project earned Southview Design a 2016 Grand Award from the National Association of Landscape Professionals’ Awards of Excellence program. 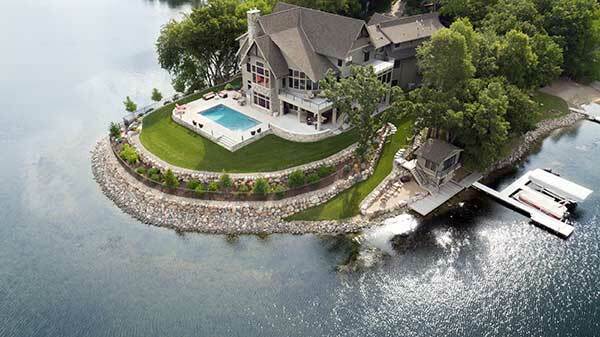 Surrounded on three sides by water, this project takes full advantage of unobstructed views of the lake. 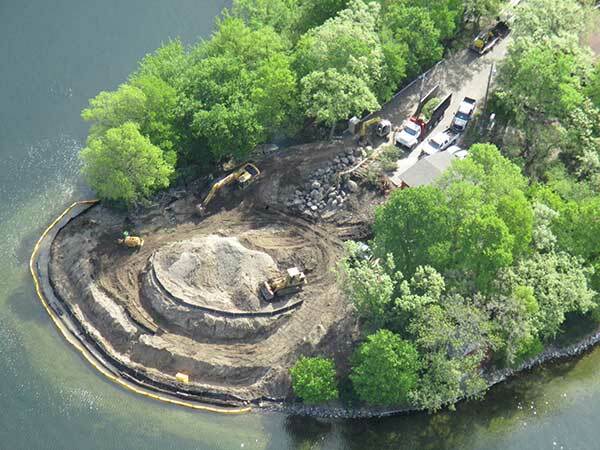 As new construction commenced, the homeowners wanted to be good stewards of the lake. Note the shoreline protection. 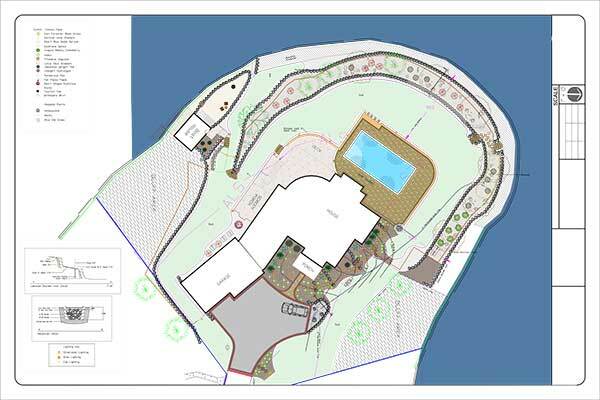 A SketchUp concept of the design was shared with the homeowner, architect and builder before any work began. This angle gives a sense of the property’s slope. The original home’s main floor was at the walkout level on the new home. 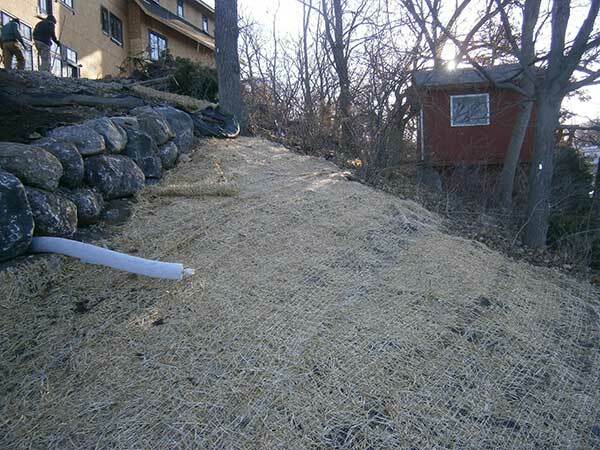 A sock on sleeving, erosion blankets and a silt fence kept the water and soil on the property. Front walk pavers match the pool deck. To the far right of the front entry, at the edge of the driveway, is the catchment well. The bio-swale on the lower tier. 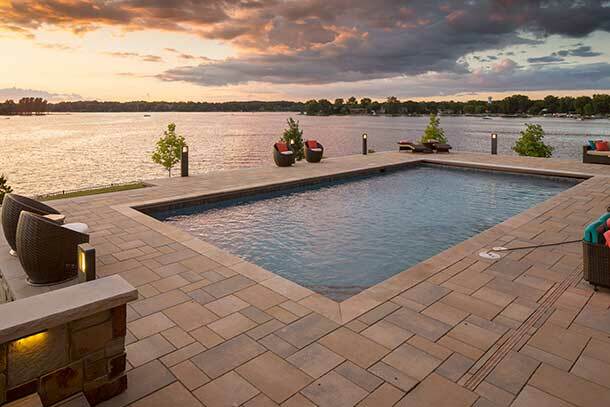 The raised pool deck with stone masonry veneer. Note how the curve of the seat wall mimics the architecture of the home. 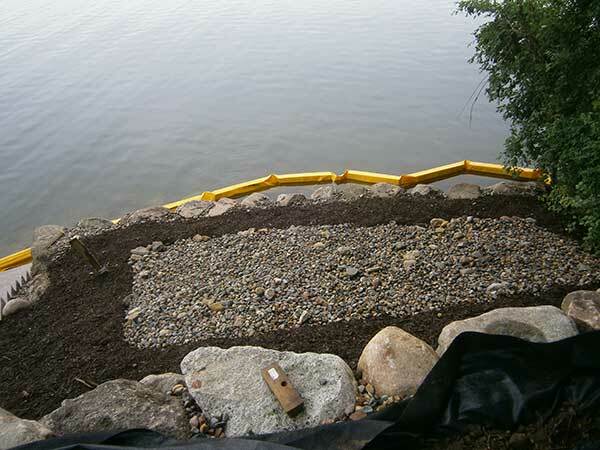 Boulders in place for a raised beach with a wood-burning fire pit. All decking is Ipe, including the decking and steps alongside the refurbished boathouse. 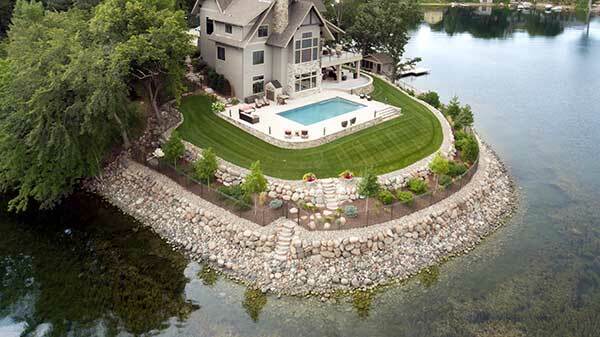 Tiered boulder walls raised the grade and keep storm water on the property instead of it draining into the lake. The required fence sits on the lower tier so it doesn’t interfere with the view. The furniture is bolted to the deck for wind stability. View from the upper deck, on the main floor. The refurbished boat house and new beach, a raised pool deck and entertainment areas, upper and lower decks give this young family plenty of space to play.